What Should I Use for My Organization's Categories? When creating categories for your Cerkl, consider the main topics that your content covers. What is your Cerkl posting about? What kind of external content are you bringing in? These are some excellent questions to ask yourself before choosing your categories. Two common tricks to nail down your categories are 1) selecting your site's main menu headers and 2) using your content's most commonly-searched or -used tags. For example, below is Entrepreneur.com's main menu. If they were to select categories for a Cerkl, "Start a Business," "Inspiration," "How To," "Franchise," and "Technology" would be excellent starting points. 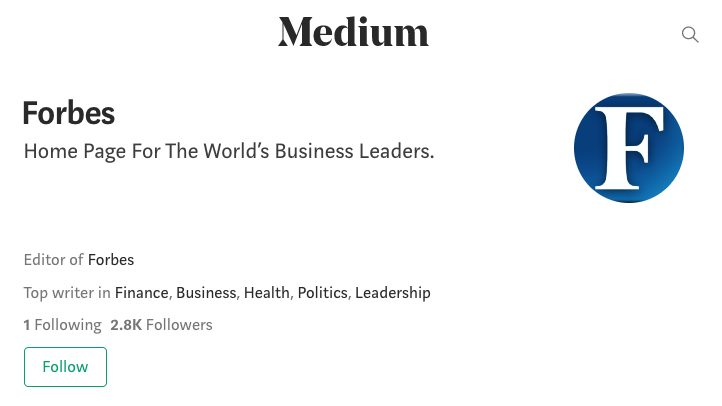 Another example - below is Forbes's Medium profile. Because they are a top writer in the fields listed, "Finance," "Business," "Health," "Politics," and "Leadership" would be perfect categories for a Cerkl. Your audience will be selecting which of these categories they're both interested in and also not interested in at all. So be sure to put yourself in their shoes in order to deliver the best options to them! More options are always better than few. Cerkl allows each organization to select up to 20 categories! You can access your categories by selecting Settings > General > Categories. Also, don't fret when creating your categories because you can always return and add or remove! Pro Tip: Generic categories such as: News, Updates and Events tend to have a lower performance rate. If your event is titled, "Carnival of the Animals - A Ballet Production" a few successful categories would be: Dance, Ballet, Creative Arts, Theater, Family Events and Animals.